We are all about throwing a bone to our valued customers! Bonus Bones is our way of thanking you for your loyalty! Shop with us and earn 1 point for every dollar you spend. For every 100 points you accrue, you will earn $5 to use towards your next purchase. Simply present your Bonus Bones card or give us your name at check out and you will automatically accrue points and redeem rewards on all products in-store! SIT! STAY! ROLL-OVER! JUST KIDDING! You don't have to do any special tricks in order to take advantage of the special savings - points are automatically accumulated on all products in store! - In-Store access to your complete purchase history. Its always a good idea in case a health or medical concern arises, or if a forgetful friend or spouse is uncertain of what brand to purchase. - Bonus Bones points expire after 6 months, so be sure to visit us regularly! - Qualifying purchases will be recorded immediately, returned purchases will be deducted. - Terms & Conditions and membership benefits of Bonus Bones program are subject to change at any time. 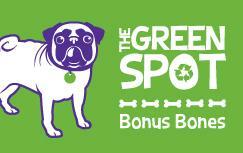 - Please Note: Grooming services are not eligible for Bonus Bones points.